That quote is at the end of this lovely blog post (see below). There is so much richness in what he wrote. What a lovely personal sharing of the meaningfulness of those that have gone before us and the special treasures they have left behind through which we can also connect to them. This post inspires me to want to go through some of my own inherited treasures, and more particularly through many of the older items that enhance The Cottage ambiance Up North…to capture their stories (as known or speculated) and to record these musings for our present edification and other’s future enlightenment. One small “treasure” that I hope will pass down to me from my parents some distant future day is a large brass key that my grandparents found beach-combing along the shores of one of the Great Lakes (Erie?). When my dad was young he used to teethe on it. This key represents mystery to me. It has a tangible connection to my Family of Origin but an unexplored and likely unknowable connection to the past. It very well could even be evidence of some long ago shipwreck. Also, its size suggests that it went to something significant like perhaps a large trunk or even an ancient door. Although its true origins will likely Never be known it’s more recent personal past is quite precious to me. So now the “To Do List” needs to expand into the cataloging of personal history archival exhibits…What (at least theoretical) Fun! 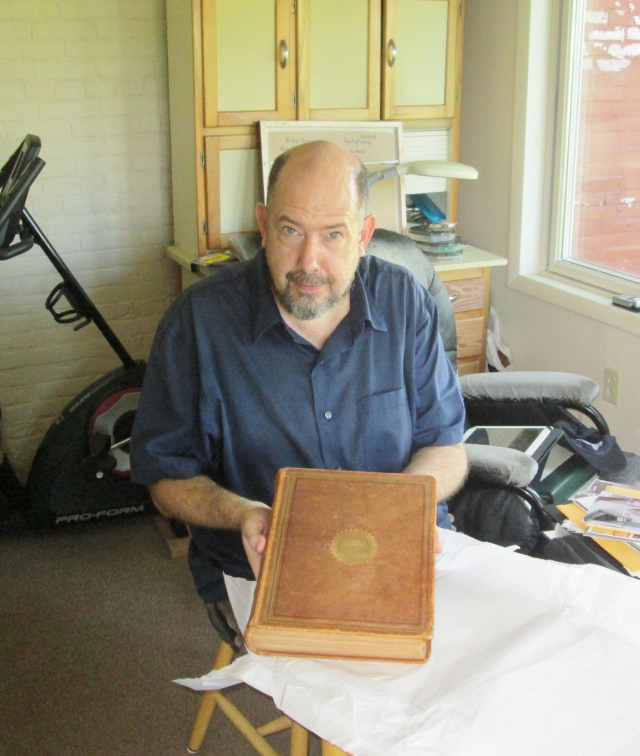 Carl with the 172 year old Monty Family Bible. On our recent trip to our hometown, my wife and I were very fortunate to be able to see and hold items that once belonged and were used by my wife’s ancestors. But even more fortunate we were to learn some of the stories behind these articles. This experience helped to bring these people from mere dates in the past to real individuals who gave the breath of life to future generations. Much of this was made possible by my wife’s cousin Carl Gonya who before high school took up the mantle of the family historian. His exhaustive research into the family lines started long before the internet made things so much easier but in many cases made for shoddier research. His collection of family artifacts and pictures is impressive and the result of diligent family research.